Seriously stylish, the 18k925 collection is a modern take on iconic glamour. The name refers to the 18K gold and .925 silver combination that makes these pieces bold, sophisticated and unique. Diamonds, colorful gemstones, exquisite quartz, and creative doublets set this collection apart. Each 18k925 design incorporates Tacori’s signature Crescent motif of interlocking half-moon arcs, and an elegant “Tacori Gem Seal” adorns virtually every piece! ...Let our passion be the Ultimate expression of your passion! Spanning four decades, Tacori designs have fused classic elegance with modern inspiration, creating some of the world’s most highly regarded and exquisite jewelry. The stunning beauty and intricacy of each piece of Tacori jewelry is the result of an uncompromising passion for artisanship. Handcrafted in California, these remarkably detailed rings and fine jewelry pieces become the timeless symbols of connection that join individuals and generations. This fresh and floral blossom right with diamond petals, 18k pink gold and .925 silver details has a chocolate-hued Smokey Quartz center that will take you right through Winter, Spring, Summer and Fall - with style! 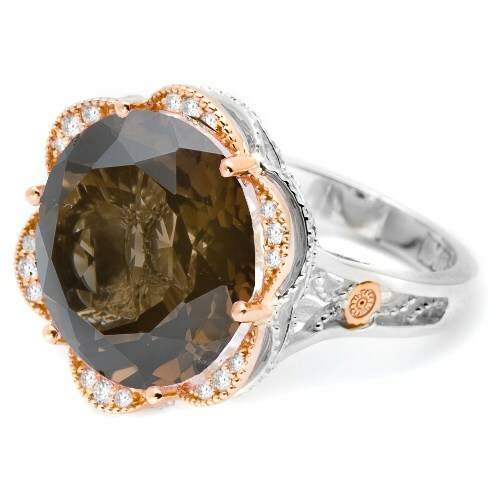 Tacori 18k925 jewelry may be available in 18K Yellow, or Rose Gold. Metal choice may be selected in the "drop down" box in the "add to cart" area. As an exclusive Tacori PARTNER, authorized Tacori Fine Jewelry retailer, our orders are always filled first. In stock items shipped - SAME DAY! Custom orders - Please allow 5-7 days for delivery. When you purchase a Tacori from TQ Diamonds, your decision is more than an investment in a beautiful piece of jewelry - it is also an investment in the lifetime care of the piece by the expert artisans at TQ Diamonds and Tacori! What does the Tacori™ Warranty Cover? Tacori™ does not sell directly to the public. Tacori™ is a designer and manufacturer of rings, fine jewelry and accessories. All of their jewelry is distributed to the public exclusively through fine quality, authorized jewelers like TQ Diamonds. At TQ Diamonds an authorized Tacori™retailer, we are happy to assist you with sales, pricing and service. TQ Diamonds has exclusive rights to represent and sell our jewelry. Tacori™ has personally selected TQ Diamonds because they have the experience and expertise to properly represent Tacori™ and provide you with the best service available. Don't risk losing your Tacori™ warranty! This warranty is void if your Tacori™ jewelry has been damaged by unauthorized service, negligence or accident, or other causes not relating to defective material or workmanship.